Katie Connell's new life in St. Marcos is cruising right along. She's got a restaurateur boyfriend, a singing venture with her best friend, and a new streak of sobriety. Even better, she's purchased a rainforest home that came complete with a centuries-old house ghost. With her legal career well behind her, she's hopeful her new chapter will lead her to happiness. But when a man from her past enters the picture, a murder in her boyfriend's restaurant and a child in need throw everything into chaos. Forced to choose between the spirited house that saved her and a man who may just be the love of her life, Katie almost yearns for the simpler dramas she faced as a lawyer. Can she make the right choice without slipping back into the destructive ways of the past? Leaving Annalise is the second standalone book in the Katie trilogy and book #2 within the fast-paced What Doesn't Kill You romantic mystery series. If you like strong women, whirlwind twists, and satisfying love stories, then you'll love USA Today best seller Pamela Fagan Hutchins' tightly-woven mystery. ˃˃˃ See why Pamela's novels have won contest after contest. If you like Sandra Brown or Janet Evanovich, you will love Pamela Fagan Hutchins. A former attorney and native Texan, Pamela lived in the U.S. Virgin Islands for nearly ten years. She refuses to admit to taking notes for this series during that time. ˃˃˃ Catch more adventures with Katie and her friends in the What Doesn't Kill You romantic mysteries. 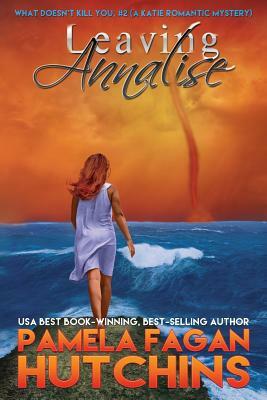 Scroll up and grab your copy of Leaving Annalise today.